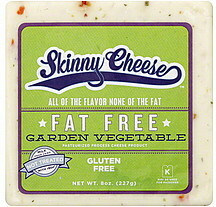 Cheese is a great source low carb source of calcium and protein. Be careful, though, cheese can also be a huge calorie and sodium bomb. Download ShopWell and we'll tell you which cheese you should be eating and recommend some other cheeses we think you'll love! Cultured Pasteurized Skim Milk, Salt, Enzymes, Nonfat Dry Milk, Water, Sodium Citrate, Mixed Vegetables, Xanthan Gum, Locust Bean Gum, Guar Gum. Gluten free.